I've been babying/abusing my 7 year old Epson 4900 but it's seen better days. I got an estimate to service it that just does not make sense. So out with the old and in with the new. I got a new Epson P50000 a slightly upgraded but basically the same machine. I do like to print real photos. I guess it goes back to my days working in studios doing darkroom work. FWIW Epson currently was a $400 rebate on this unit but it must be invoiced by June 30th. Not trying to promote the channel or anything, but I did come across this video recently on Youtube. Seems like Epson is a pretty good way to go. I've given up on printing my own photos. I did have a cheap-ish inkjet printer that I printed a few photos from in the past. Afterwards, whenever I wanted to print anything the cartridges were always dry. I print so infrequently I'd rather just order and I ended up just buying a laser printer for the odd times I need to print a document at home. Seems like they were also doing a good discount if you trade in a printer, although I'm not sure if that was an EU only thing. 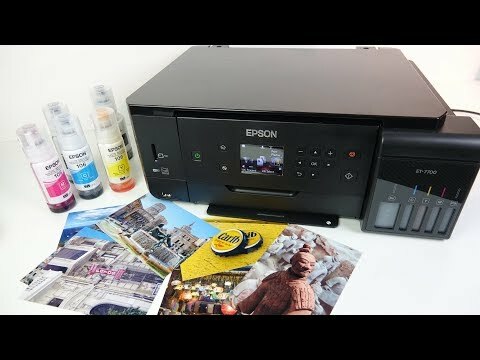 Looks like this is the Epson ET7700 and you can refill the cartridges on your own. That printer for some one printing from a P&S camera. You buy top notch DSLR's and pro lenses to get the best image. To print out those great images takes a top notch printer. I almost got it but am use to its bigger brother. I almost bought the Canon Pixma Pro-100 when Adorama had it for $59 after rebate, but held off. Now it's $119... I'm trying to decide if I still want it. You're probably right, I'm not well read on printers. Wow, I forgot about Greg Cazillo. I remember when he used to work with Fro Knows Photo, before they split. I have 1 green ink 60% , 2 orange 90%, and a yellow 60% all less than a month old. FREE I'll even pay to mail them, in the lower 48, to 1st person that will use them. I hate to see them wasted. framer is that a P50000 model or P5000? I've wanted to upgrade from a P800 to the P5000 for sometime and may this coming year once I can leave it in the van as a rolling studio. I like to make test prints before leaving a location where $'s have been spent on a trip. I don't have the cutter for the P800 that is included in the P5000. There is a possibility I will down size to a 13" model and be content with 13x39 in panoramas also. My 2cents, the P5000 is big, twice the footprint of the P800 and weighs around 100lbs. The other issue is how hot a van could get and effect the inks drying out. The P800 being around 40lbs could be removed and stored in a better environment when not being used. Having owned a 4000 and 4900 Epson printers it important to keep them in a controlled environment or you will have cloging problems down the road. That said, the P5000 is a WOW printer. 17" x 96" pano's on canvas was been my best seller at the old frame shop. I'm hoping they keep selling now that I sold the frame shop.